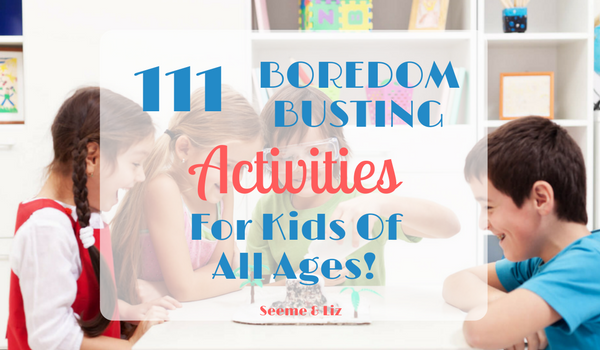 111 Creative Boredom Busting Activities For Kids Of All Ages! 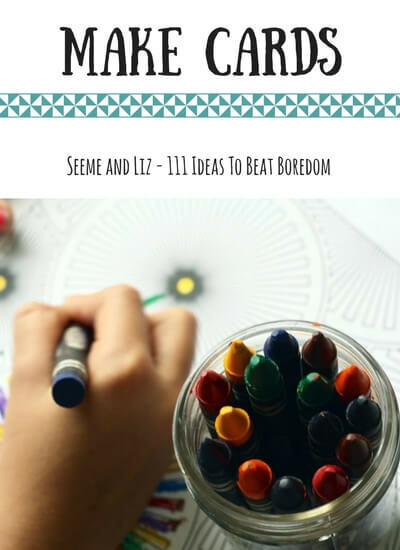 Seeme & Liz > General Parenting Tips > 111 Creative Boredom Busting Activities For Kids Of All Ages! Boredom leads to creativity, so don’t feel like you always have to entertain your child or have them involved in structured activities. In fact, be sure to refrain from always “planning” activities for your kids! Let them be bored and come up with their own ideas. But, that being said, there are times when hearing “I’m so bored” over and over again can get irritating. So, break out this list and give your child some suggestions. My children love playing with cardboard when they are bored. They have created some pretty cool things such as a Skylanders Teleporter, a moving office, a marble run, Sponge Bob’s house, a Zhu Zhu pets village, and many more! 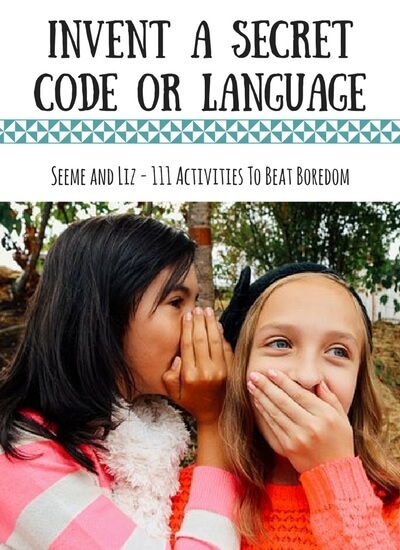 There are so many things children can do (that don’t cost an arm and a leg – in fact, most of these ideas won’t cost you anything other than some time and imagination) that do not involve a TV, iPad or structured activity (e.g. gymnastics class, dance class, sports, etc) when they are bored. 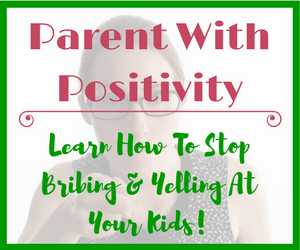 I have come up with 111 fairly simple ideas that we use in our house as well as some suggestions I have received from other parents. Some of these activities will require your involvement. Depending on the age of your child, you may be able to simply give them the idea and then let them decide what exactly they want to do. This shouldn’t come as a surprise, based on what I mentioned above. Here is another favorite at my house. My kids love cooking the food at their pretend play kitchen and then serving it to each other or any adult willing to play the customer. If your child is already printing, have him write out a menu! Use this easy homemade playdough recipe together with your child. Now that you have made your playdough, get out some plastic cutlery, plates, rolling pin, cookie cutters, etc and start playing with the playdough. If making your own playdough isn’t your thing, don’t worry, there is a lot of playdough you can order online and have delivered right to your door! I used to love this type of toy phone as a child. It’s a craft and toy in one! You can make this as easy or challenging as you want. If your child is young, start simple. Give them obvious clues such as “I think something is hiding behind the couch”. A scavenger hunt is great for working on following directions! Older children can come up with their own, more complex scavenger hunts. Or you can come up with one and have them try to find all of the clues. Another childhood favorite of mine! The simplest way to make these is with old tin coffee cans. I like the ones from Costco. They are a great size for little feet. Turn the cans over and make 2 small holes in the bottom of each can (one on either edge). Thread string (the heavier the better) through the wholes and tie together at the top. Cut the string long enough so that it reaches the child’s hands. Place one can under each foot and let them hold the string from each can as they walk. 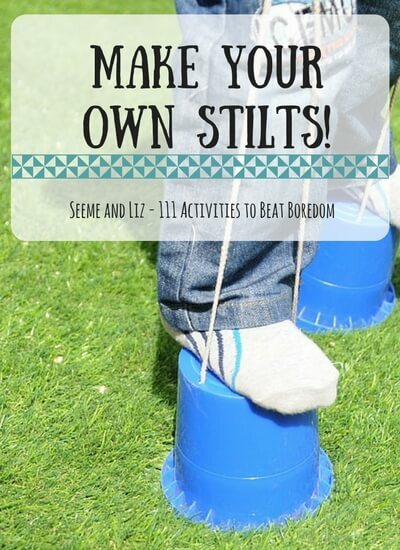 Use the tin can stilts you just made as one of the circus acts. Gather all of the stuffed animals you have so they can perform in the circus. Set up a tent to collect tickets. Let your imagination run wild. See what you and your child can add to your circus. A tightrope (tape on the floor) perhaps? This works best if there are multiple children/adults. However, my daughter did like playing hide and seek with me when she was between 2 and 3 and it was only her and I playing most of the time. She loved it, even though she hid in the same spot every time. You can take this as a learning opportunity and explain to your child that they need to find different places to hide and that you can remember where they were the last time. But if your child is young (under 3) she probably won’t get it. But they still love this game! This is also known as Sardines. Instead of everyone hiding and one person looking, everyone looks and one person hides. But, when someone finds the person hiding, they don’t call them out, rather, they hide with that person and everyone else keeps looking. You don’t need to go to the bowling alley for this (although for older children it would probably be more fun that way). You can set up stuffed animals to knock down with a ball if you don’t have any play bowling pins, or collect empty water bottles to use as pins. If your child has a language delay, find some simple images of common words to print out (E.g. key, flower, cup, shoe, chair, bed, hat, dog, cat, etc) and tape them under the bowling pin (or whatever you’re are knocking down). Each time a pin is knocked down, turn it over to see what the picture is. Bubbles are great for encouraging early language skills. But older children still find them fun. An older child can blow bubbles for a younger child. If you would rather not blow bubbles, there are many battery operated bubble blowers available as well. My children think I am the greatest mother on earth when I tell them that they can play in the rain. Let them get dirty, the clothes can be washed. Send them out with some beach toys and rain gear. Grab a bucket, a net and a bag and go exploring. Collect things like leaves and pine cones. Try to catch a frog or insect. Talk about what you see. After you get back from your walk, make a craft with the items you have collected. Try putting some leaves between sheets of paper so they can dry. This is pretty self explanatory. Get on your bikes, or walk, and explore the neighborhood! Do this several times a day, especially with younger children who are not in school or reading on their own. When my daughter was a baby, I made her a book with pictures I took of some of her favorite toys and other items around her. I printed out the pictures and put them in a cheap photo album that allowed for one picture per page. I then printed out labels with the name for each item in the picture. We would “read” this book together. It was one of her favorite books. She carried it around with her everywhere. Now she has started writing her own short stories. And her younger brother is now starting to do the same! If you aren’t sure what board games to start with, check out the Top 6 Best Family Game Night Games! Head out to the community pool (or your backyard if you are lucky and have one there) for an afternoon/evening family swim. Or if the weather is nice set up a kids pool where the kids can splash around. Throw in some bath toys, cups and spoons to make it more fun. Make a map for your child giving clues for where a special surprise can be found. This goes well with the scavenger hunt! If your child is older, have him make a treasure map for you and see if you can find the treasure he has hidden. Blocks such as Lego or Mega Blocks can entertain a child for hours. If your children are older, having building competitions. Or work as a team to build an entire city. My children made their own Nintendo DS’s out of Lego (because I wouldn’t buy them one). I know some parents will cringe at this, especially in the house but I can guarantee your children will love it. When it was just my daughter (before my son was old enough to want to join in on everything) I would fill the sink with a bit of water and let her play while standing in the Learning Tower. She would pretend to wash the dishes – I filled the sink with plastic dishes. Once my son wanted to be involved I put a rubbermaid bin on the tile floor and filled it with some water. The kids put their bath toys in or used their pretend fishing set and would play for an hour or 2 at a time. Yes, there was always water on the floor, but since it was tile, I could easily mop it up. You can also put a plastic table cloth under the bin to protect your floor a bit. Make paper weights or pets by painting rocks that you may have found on your nature walk. Add googly eyes to make the rocks even better! Pull up the couch cushions, put together some chairs and cover everything with sheets! Or get a prefab fort set such as Crazy Forts and come up with some cool configurations. You could even make a spaceship and check out the moon! This is more for older children and it’s not technically screen free. I always recommend younger children, especially under the age of 5 learn better through playing with traditional toys. Learning how to code is a great way to use other areas of the brain! Check out An Hour Of Code for a fun free online program great for kids and adults (who don’t know the first thing about coding, like me – although I have surprisingly been able to learn some while working on this site. My husband is a software developer so maybe the kids will take after him). Kids can be entertained for hours when they dress up and pretend to be pirates, princesses, firefighters, doctors, vets, etc. 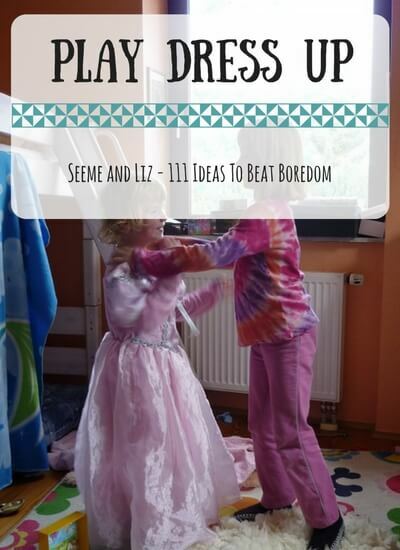 Encourage your older children to work together to come up with a play with their dress up clothes. But then be ready to watch them preform the play. You can’t say no! My kids love doing this with their friends. They will even make tickets to give to the adults so that we can come and sit and watch the recital. Here is another game my children love. Gather all of the chairs and line them up in the hallway. They make sure no seat on the plane/train is empty by letting each of their stuffed animals have a seat. Make tickets and passports and talk about where you are off to. To keep the activity going, pack a small bag with items that might be needed for the trip. This can be a real list or a pretend one. 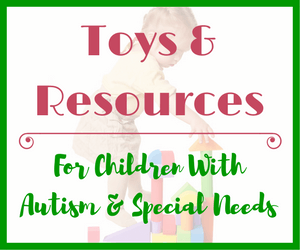 Make a grocery list, a to do list, a Christmas list, a “toys to donate to charity” list, etc. This is a great way to get children to practice their hand writing skills while making it seem fun. Gather real or pretend items and place them around a room. Make a list and decide what needs to be purchased. Then go around and find those items. Use a calculator or toy cash register to check out and pay for your items. If the rocket car seems a bit too much, give the mentos rocket a try. All you need is a 2 liter bottle of coke (some say diet is better than regular) and a few mentos. Drop the mentos in and watch it explode. 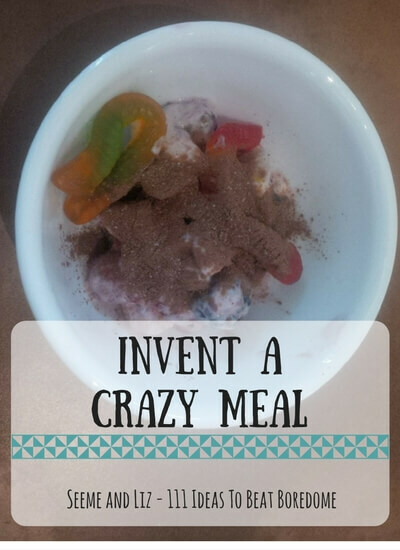 There are many simple recipes that you can do with your child. I find it easiest when I get all the ingredients ready and measured (especially with younger children) before getting started with my child. The kitchen is one of the most social rooms of a house. There are many opportunities for language development and learning in a kitchen as well. Read 3 Fun Kitchen Activities For Kids! for some ideas. This can be done indoors or outside! Talk about what you will need for your picnic and gather everything up. My son loved doing this when he was between 2 and 3. We would cut out black pieces of construction paper (any color is fine) into “roads” and tape them together to make various road systems. Then take some small cars and drive them around. You can also do this with sidewalk chalk outside. Build a big road to drive your ride on vehicles on! 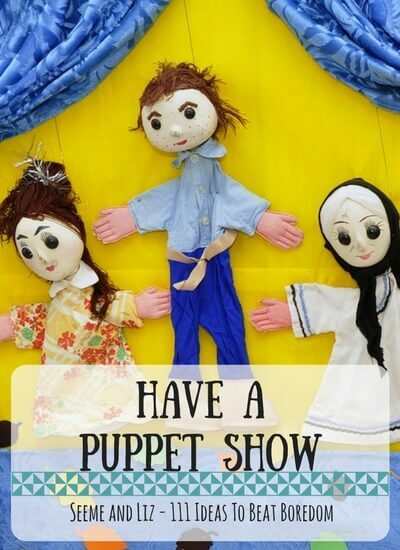 You can make sock puppets or use stuffed animals. If you have a large cardboard box or piece of cardboard/bristol board, use this as the theater. You don’t always have to buy new books when your child gets bored with the ones you have at home. You can spend as little or as long as you would like at the library. Most libraries have “story time” and other programs geared to children under the age of 3. Make sure you take advantage of these free programs. Puzzles are great for children of all ages. Start with insert puzzles and move up to jigsaw puzzles as your child gets older. Make your own paper mache head with a balloon or create a pinjata! Finger painting is fun for children of all ages, from babies to school aged children! If you are want to try finger painting with a child under 2, try using pureed foods in a variety of colors. That way if your little one decides to lick his hands, he won’t be eating paint! Use a flashlight to make animals and designs with your fingers. This can be done outdoors with chalk outside or indoors on a carpeted area with masking tape. Collect some old pictures and glue them onto sheets of paper. Decorate the paper with glitter, pompoms, stickers, etc. Staple all of the pieces of paper together to make a book. This is another favorite for my kids. They have made up their own language but I am pretty sure they just make it up as they go and it changes every time they use it. Some ideas include “What time is it Mr. Wolf?”, “Red Light Green Light”, “Red Rover”, “Simon Says”, etc. Use a soft ball and small net or even a bucket/bin and this activity can be done inside. Decorate a plastic lid with paint, markers and stickers. If you already made stilts (number 7), save the lids from the coffee cans to make a Frisbee. Young children will be thrilled to see what happens when you mix baking soda and vinegar. You can also purchase science kits for older children. Let your inner archaeologist out! Set up your own dig in a bin filled with sand (or an outdoor sandbox) and hide small dinosaur toys in the sand. Or check out some dinosaur kits such as Back In Time With Dinosaurs (a Magic School Bus Science Kit). Use an old jar or container. Decorate it and poke holes in the lid. Then find some bugs to catch! Letter mail is becoming a thing of the past, so surprise a relative or friend with a letter or picture in the mail. Or get some fabric markers and color a picture onto an old shirt. Find some old socks and use buttons and glue for the eyes, or just color them on with marker or fabric paint. The puppets can then be used in the puppet show (number 38). You can fill the balloon with a bit of water to make it heavier. It shouldn’t pop with only a bit of water. But if it does (and you are playing this indoors), remember, it is just water and it will dry. Use macaroni and string with younger children. Spray paint the macaroni first if you want it to be colorful. You can also use beads of any kind. 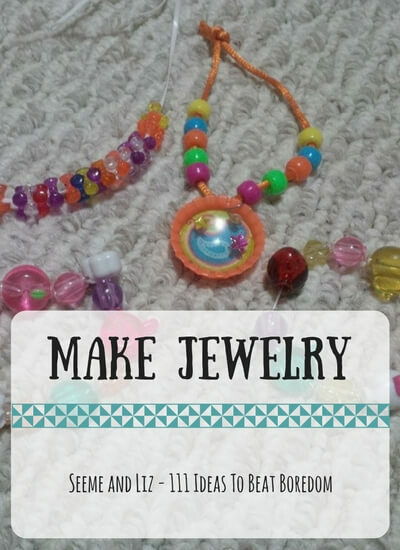 My daughter has a few “jewelry making kits” that she loves. This is for pretend letters. Use stickers as stamps that can be purchased at your post office. Pack toys into small boxes to be shipped. Give your child an old camera and let them take “secret” pictures. Pretend a pair of sunglasses are spy glasses. Use the tin can phone (number 5) as a spy walkie talkie. This is a simple game that can be played with a variety of different cards. You can even make your own. Find some pictures online and print out 4 copies of each. Glue them onto index cards and make your own game. This is another game you can make yourself. Cut circles out of various colors of paper (heavy weight paper is better so it won’t rip) and tape them to the floor. Make small cards with pictures of colors and body parts (hands, feet, head, nose, finger, knee) and put them into a bag. Pull out a body part picture and color picture and then tell your child what they need to do (e.g. put your nose on the red circle). You can make different shapes to make the game more difficult. Or use numbers instead of shapes. 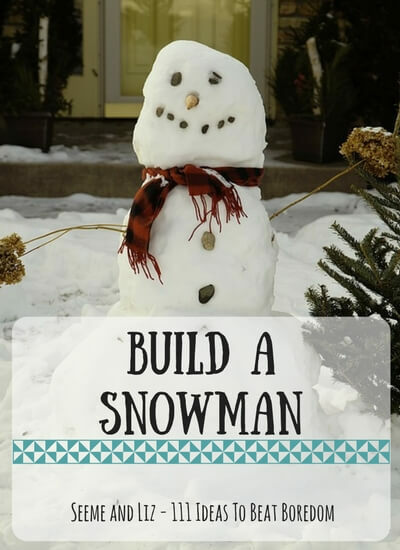 You can do this in your backyard or indoors! Use your imagination. This can be done indoors or outdoors. This is great for older kids. Have them come up with a list of words and then show them how to draw a big chart (large enough to fit the longest word). Fill in all of the words and then add random letters to hide the words. Give the word search to a sibling or another family member to complete. Shout out a word and see who can come up with as many words that rhyme as possible. Get silly and make up your own words. Use toy instruments or find items around the house that can be used as instruments (pots, pans and wooden spoons come to mind). Dress up clothes would work well for the parade. I would probably save this activity for a day when you have had a good nights sleep and don’t have a headache! Make your own funny story. One person says a word and then the next person adds a word. Keep going to make a funny story. This is great for long car rides! This is similar to a picnic but probably appeals more to girls. Although there is no reason why boys can’t play tea party. Once you have the hang of it, have a contest. See who can hula hoop for the longest. Make paper airplanes and see whose will fly the farthest. Decorate your plane with stickers, glitter and marker. You can use pita bread to for a quick and easy pizza crust. They make great personal size pizzas. Add whatever toppings you like best. Talk to your kids about kitchen safety! Find an old pillow case and cut a whole at the top for your child’s head to come through. Let your child decorate the dress/cape. Use string/wool to make a belt. Explore the neighborhood park. It is great to learn new words and get some exercise. Older kids can play games like “hide and seek” at the park. This can be fun for older kids. It can be a secret language as well! Let your child help you plant flowers outside. Or find a small flower pot and plant a flower to keep in the house. Talk to your child what a plant needs to grow and thrive. This is a great way to practice rhyming words and printing. Mail the poem to a friend or relative! Set out some blankets and pillows and come up with a gymnastics routine. Somersaults and jumping jacks count too! Gather friends, stuffed animals, siblings and pretend you are a teacher. Give the class an activity to do and help those who can’t do it on their own. Remember to take attendance! A kaleidoscopes can entertain a young child for quite some time. Make it even more fun by creating your own! See who can skip the most times before tripping on the rope. Do it frontwards and backwards for more of a challenge! This is an oldie but it’s a good one. Kids love collections. Why not collect stamps? They are getting more and more rare each day. Stamp collecting is a great way to teach patience as it takes a while to soak the stamp off of the paper and you have to wait for the mail each day to see if there is a new stamp. You can do this quite easily with some popsicle sticks as the frame. Mix a few drops of glue with paint or food coloring and “paint” it on to some plastic wrap. Cover that with another piece of plastic wrap and then attach the popsicle sticks to make a frame. Pre-make some birthday or Christmas cards to have on hand for when you need them. All you need is some paper, crayons/markers and maybe some scissors. Rubber stamps would also come in handy but aren’t necessary. You will need to purchase some modeling clay for this. It is a great activity for older children who are no longer interested in playdough or want a change. This is kind of like star gazing except it can be done during the day. Lay on the grass and look at the clouds. Talk about the funny shapes you see. Make a time capsule. Put some items into a box, plastic container or resealable bag. Write a letter explaining what each item is that will go into the time capsule. Bury it or hide it away in the house somewhere. Find an old cardboard box and decorate it. This box can hold all of the rocks you collect. Turn some of the rocks into pets! A simple one I was just told about requires an orange cut in half with the contents scooped out. Then poke holes around the top (where it is open). String some yarn/thread through the hole so you can hang it. Fill the orange with birdseed. Wrap some old toys, make a card, make party hats and use play food as the birthday cake. Don’t forget to sing “happy birthday”. My kids love having birthday parties for their stuffed animals. This is pretty self explanatory I think. Only applicable if there is snow, as you may have guessed! Cut the fingers off a rubber glove. Add faces, hair, clothes. These can also be added to the puppet show (number 38). It can get messy so make sure to keep the goop in a bag for storage. You may also want to set some rules around where the goop can be played with. You can do this indoors by laying cups on their sides and using them as the holes. Outdoors, you can bury the cups in the ground, leaving just the very top of the cup showing so the ball can roll into the cup. Head to the recycle bin and see what you can string together to make a wind chime – Reduce, Reuse, Recycle! Fill a plastic bin with rice or dried beans. Then hide little toys in it. Let your child explore with with her hands. See if she can guess what she found before looking at it, using only the sense of touch. You can also use cups to “fill” and “empty”. Fill a jar with water and sprinkles. Add pebbles, beads, foam letter/shapes and glitter (this will be the “snow”). You can also add a bit of food coloring if you want to change the color of the water. Make sure the lid is screwed on tight. You can add a bit of glue to the lid to make sure it never opens. Worm salad sounds good, doesn’t it? Think about how you would make something like this, then write the ingredients on an index card for future reference. I know my kids would include gummy worms and lots of fruit in their worm salad. I would add some yummy yogurt dressing! Come up with ideas of ways you can help someone. This could be as simple as finding a toy to donate or perhaps going through your cabinets and finding a few cans of food you can bring to the local homeless shelter. Talk to your child about others having less than them. These are super easy and fun. And can also be added to the puppet show (number 38). Either cut out eyes, nose and mouth or draw them on with paint or markers. Add ears, feathers, a tail, etc. We go through so many balloons every summer. I find that regular size balloons are more fun and last longer than the small ones that are meant to be water balloons. They don’t pop as easily and you can make them small or really big. The bigger you make them the easier it will be for them to pop. Come up with a survey. Write down all of the questions (or you can write down the questions your child comes up with if they are not yet writing). Poll friends and family. Even if it isn’t Christmas, these are fun to make. Plus they can make cute Christmas gifts, so hang on to them if it is July when you are reading this. You will need to get some clear glass ornaments, a few colors of paint and some glue. Take the top off the ornament, add a few colors of paint and a few drops of glue. Cover the opening of the ornament with a paper towel and then shake and swirl it around. When there are no more clear spots left, turn the ornament upside down (into an egg carton works well) so any excess paint/glue can escape. Fill a small kids pool with lots and lots of soap and water. Make soap hats and beards. Have a “soap ball” fight! This game is a classic. 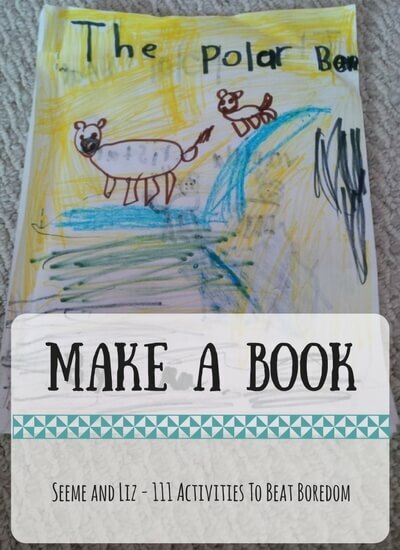 For younger children (who can read), write simple ideas on a piece of paper that they can act out. For example, firefighter, waiter, doctor, erupting volcano, etc. Get outside and draw. Lay down and trace each other’s bodies. Add crazy things to the outlines such as wings or horns or an extra arm. Take a doll or stuffed animal to the “hospital” or Doctor’s office. A toy stroller can be a wheelchair, toilet paper can be used to make a cast. Don’t forget to check the patient’s temperature. Everyone can have a role – mom, dad, brother, sister, baby, family pet. Let your imagination run wild. Draw your own designs on paper – the bigger the piece of paper the better. If you don’t have any big pieces of paper, don’t worry, just tape smaller ones together. Then make a gift that you can wrap with your new paper. Use popsicle sticks to make a picture frame. Decorate the frame. 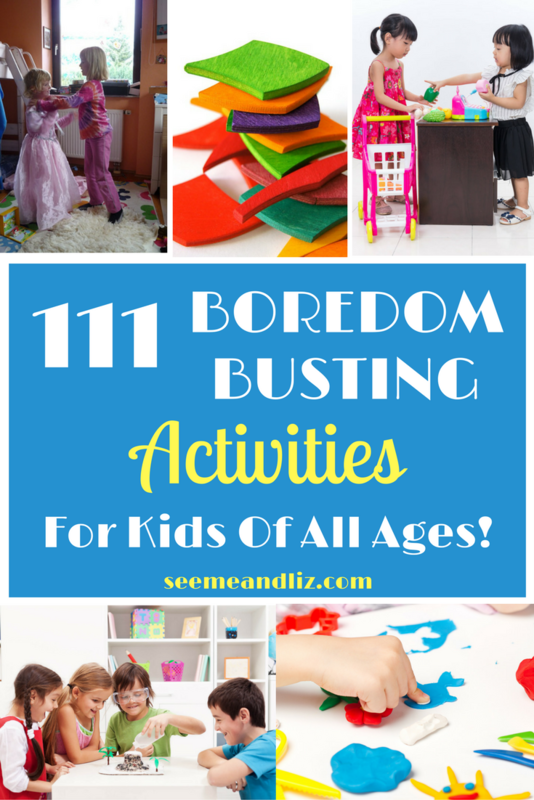 The next time your child tells you that he is bored, pull out this list! There are many things that I haven’t mentioned but this article can easily turn into a book if I keep going. Don’t forget to download the PDF so you can have the entire list saved on your computer/device and have access to the 7 Bonus Ideas! Is there anything you would like to add to the list? Which of these suggestions have your kids tried? Please share your thoughts in the comments below! Wow!! this is one REALLY USEFUL article! Sooo many ideas! How did you come up with all of these? And most of them are basically for free. Thank you so much!! (I downloaded the PDF as well). I have a big boy who is already 11, so he makes himself busy. But I also have 2 little ones – a three years old boy (with special needs) and a 16 month old girl. And yes, this is really hard to keep them busy. They require so much attention. And for me, to come up with new ideas for playing with them is such a headache! So, thanks again!! And I’m definitely going to share this one! Thanks for your lovely comment. I am glad that you enjoyed the article. It’s great to hear your 11 year old is finding things to do on his own (assuming that doesn’t mean sitting in front of a screen all day). Your younger 2 definitely need your involvement while they play. But keep in mind that it is important to encourage independent play as well! You may be interested in this article about the importance of play skills in children with special needs since you mentioned having a 3 year old with special needs. Hi, Kids always say they are bored but you have come up with so many things for them to do. Teaching your kids to make up games to play when they are dying from boredom is great. I enjoyed many of the things you talked about from playing dress up to doing the hula hoop. I played those games as a child and now with my nieces and nephews. 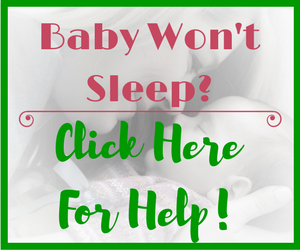 This site is awesome and I will be sure to share with my family. Thanks for your comment. Unfortunately kids always seem bored these days. Depending on the age of the child it is fine for a parent to step in and offer suggestions. But be sure to keep this at a minimum, especially as the child gets older. Children must learn to occupy themselves and find fun and creative things to do on their own as well. I admire you for coming up with so many ideas! And most of them don’t really cost anything. There are a lot of activities that I wold like to try with my sons. My oldest is 2 years and he absolutely loves to play hide and seek. But like you mentioned, your child always hid in the same spot, my son almost always hides where I hid. I find that playing games like that and coming down to their level really helps us bond. I tried to keep these activities as simple as possible! You probably have a few more years ahead of you before you son really understands the concept of hide and seek. 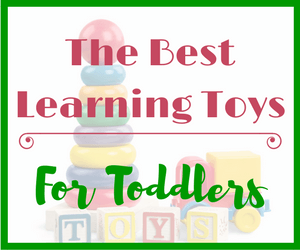 Take a look at some of these fun games that are ideal for toddlers! I think you might enjoy playing some of these with your son as well. This is a super great site and I will be sharing it with my daughter who has a 4 and 6-year-old. These kids are always building forts in the living room and creating all kinds of imaginary scenarios. I love how you have many choices and they’re all great. I especially like building a kitchen, Great post! Thanks for your comment and for sharing my site with your daughter! My kids love building forts all over the house as well! Wow! These are A LOT of possible things we can do with children when they are bored. Parents, baby sitters, as well as teachers should have a lot of things in mind to do with the kids to help them avoid boredom. That’s a great article, thanks for all those wonderful ideas! Yes, there is no reason why a child should be bored with this list! Glad you enjoyed it. Wow, how did you came up with all of these ideas? I think that most of the stuff that you have mentioned are just awesome in so many ways. Keep up a good work. Thanks! It took a lot of brainstorming over several days to come up with these ideas. 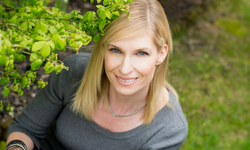 I carefully watched my kids play and thought about things we did when they were younger. I also asked other parents for things they do with their children when they say they are bored. 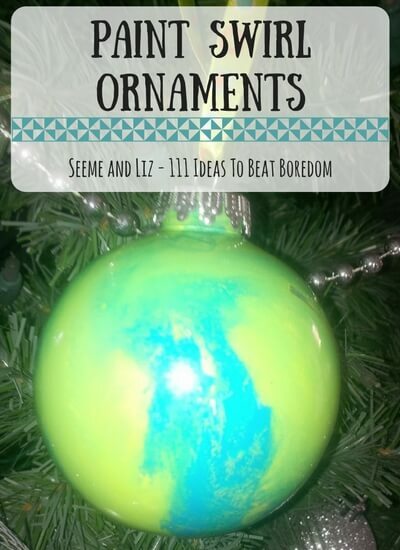 I love the ideas for what to do when kids are bored! My girls love to make things all the time with paper, cardboard, wrappers and anything that they can get their hands on! I don’t indulge them with ipads and electronic gadgets so they are left with their own imagination a lot of the time. I’ve bookmarked your site for ideas. Thanks! I’m happy to hear you love these ideas! Your girls sound like my kids – they love getting creative. My son is always raiding the recycle bin for items he can use to build with. If you had a child an iPad or other kind of screen, chances are they will sit there for hours with it. My son is like this. My daughter luckily can only handle about half an hour to an hour in front of an iPad. Then she gets bored and will play with her toys. Make sure you download the PDF and get my 7 bonus ideas! Feel free to share the list with family and friends. It’s the holiday season and my niece and nephew are really looking for stuff to do. I know they don’t want to have anything to do with books – they already have so much of those at school. Swimming – Despite adult’s belief, kids totally love water and they behave more naturally (without fear) when being introduced at a young age. Play In the Kitchen – My niece loves to join me when I am making smoothies in the evening. Be a Scientist – There are a few planetariums in the city that kids love to visit. I think places like these encourage them to dream and explore. 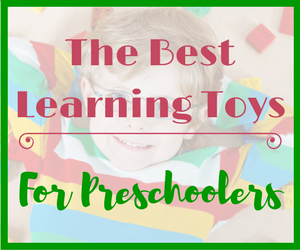 I’m happy to hear that you will be using some of these ideas with your niece and nephew. My kids have been going to swimming lessons since before they were a year old and they both love the water! They also love doing home made science experiments. I took them to the science center thinking they would be fascinated but they didn’t seem all that impressed. They prefer doing the experiments in our kitchen. 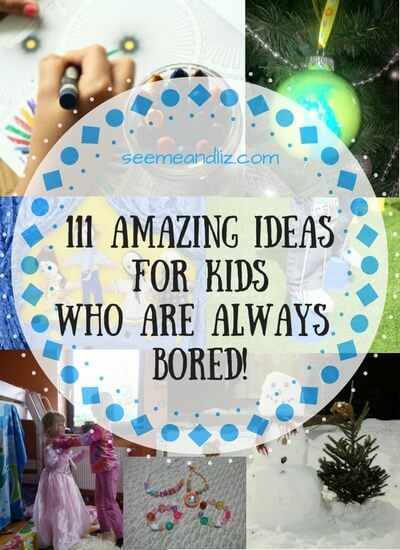 Awesome list of fun ideas for kids when they are bored! Definitely going to bookmark this for future reference. I really like that most of these ideas are either free or very inexpensive. My son is going to have a blast! Thanks for all of the new ideas!!! Ill let you know how our mentos rocket car turns out! Thanks Jay. Make sure you download the PDF version of the article. 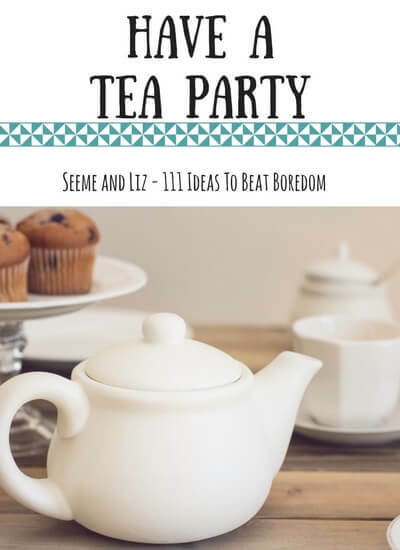 I have also included 7 bonus ideas that I am sure you will love! I’m looking forward to hearing how you Mentos Rocket Car turns out.